New Angle on Dimensional Inspection | KLH Industries Inc.
Quality engineers at KLH Industries are seeing a whole new angle of dimensional inspection: 2,951 new angles to be exact. In early summer, KLH paired its existing Brown & Sharpe 9.15.8 Coordinate Measuring Machine (CMM) with a second Brown & Sharpe Global Advantage 9.15.8 CMM. 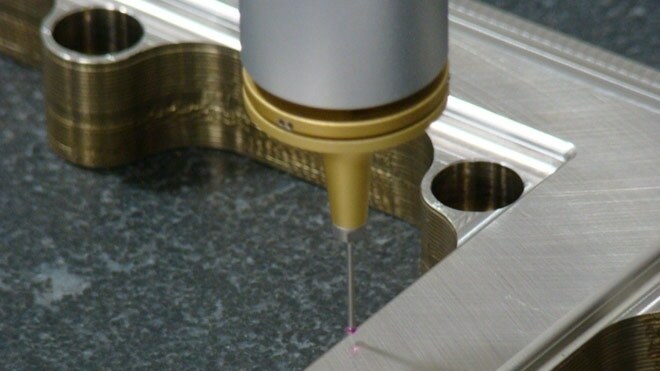 Unlike the current CMM, the new 9.15.8 utilizes an articulating probe head, capable of indexing at 5 degree increments across +180 to -180 degrees of revolution, and +90 to -115 degrees of pitch. The probe supports styli 0.8 to 4.5 inches long. Though it offers a wider gamut of applications and possibilities, the additional mechanisms in the LSP-X1s articulating head are slightly less accurate when positioned at a pitch. At 0 degrees, both CMMs are accurate to 2 microns, or +/- 0.00007". Plenty accurate for a wide range of applications, including KLH-manufactured parts for the International Space Station (pictured above). Of course, all CMMs are volumetrically accurate - meaning accuracy decreases when checking across long features or distant relationships. While volumetric accuracy is commonplace among quality professionals, the 9.15.8 model is designed to reduce variation across distances. Appropriately so, when each CMM at KLH has X-, Y-, and Z-axis travel limits of 35.4", 59.0", and 31.5", respectively. PC-DMIS incorporates scanning and digitalizing features that allow fast and efficient measurement of complex shapes such as turbine blades, dies, models, sheet metal components and other curved shapes. Visitors may find that stepping into KLH's quality lab is an entirely new experience altogether. The entire lab was expanded six feet to fit the second machine into a temperature- and humidity-controlled environment. Purchasing a second CMM doubles throughput in the quality lab, while adding new features and applications. KLH is currently offering dimensional CMM inspection services in adherence with ISO 9001 or AS9100 quality management systems.